Caring for an aging cat can sometimes throw curveballs, even to long-time cat owners. Senior cats are more susceptible to diseases and health conditions, which at times can be difficult to navigate. If you are also a canine owner and need tips on caring for an aging dog, feel free to check out our post on How To Care for an Aging Dog. For those of you who are strictly cat owners, this article will detail things to be on the lookout for and how to help your senior cat. As cats near older adulthood, it is important to stay up-to-date with veterinarian visits. Most veterinarians suggest bringing your feline in at least once a year, with twice a year being the optimum in some cases. Arthritis, dental disease and kidney disease are three common problems our older four-legged friends are prone to. Additionally, arthritis may be very painful, but some cats try to hide their pain. Don’t wait for your cat to show you that she is suffering. Frequent vet trips may help detect these problems early. On the low end, a cat may be considered a senior anywhere between 7 and 10 years old. With quality of life and longevity improving, some cats live well past 15, and even into their twenties. Discuss with your vet a plan for how frequently vet visits should occur. Just as younger kittens need protein in their diets, so too do elder cats. Cats are carnivores by nature, and without a sufficient amount of protein from meats, cats will be missing out on nutrients such as taurine and arachidonic acid. Interestingly, cats actually require more protein in their diet than dogs do. Be sure to keep a healthy amount of protein in Princess’ daily nutrition. Has your cat ever sat on the windowsill, bathing in the warm sunlight? Many kitties like to get cozied up in a safe, comfortable and warm spot for relaxation. 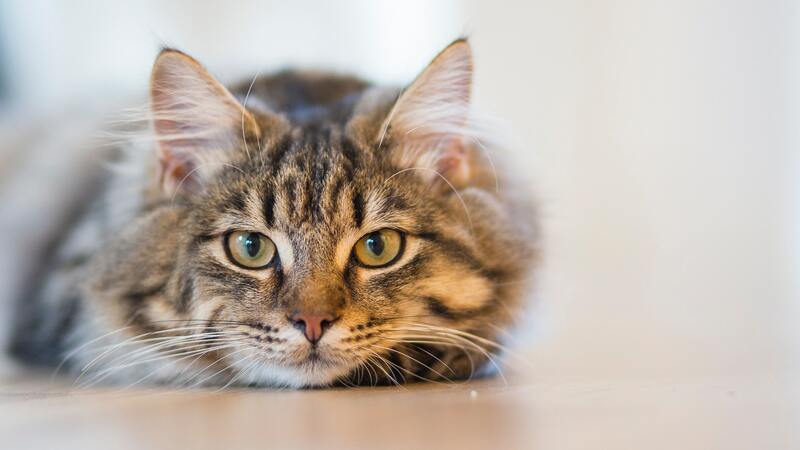 As kittens grow into adult cats, making sure their favorite bed or pillow is in a warm location, away from windows or doorways with significant drafts, can be a sense of comfort and familiarity for your furry friend. Avoid placing her bed in a place where she could overheat. This is a more significant danger for cats that can’t move very quickly. As cats become older, sometimes they have more difficulty grooming themselves. If this is the case for your furry friend, gently groom her to remove uncomfortable excess hair that can easily become matted. Particularly if Princess is suffering from pain from arthritis and is unable to jump onto tables or climb into the litter box as easily as she once could, consider making adjustments around your home to accommodate her new, less active lifestyle. Purchase a litter box that has lower walls, so she can more easily get in and out. Be cognizant of where her food and water bowls are located. If she has trouble climbing up and down stairs, keep her food and water on the ground floor. Make her bedding extra comfortable by adding extra blankets and padding. Physical and mental stimulation are important in adulthood as well. Walking outside can help keep Princess’ muscles and joints in decent shape while also providing a good form of exercise. Indoor activities and playing with Princess are also important to help keep her entertained and mentally stimulated. Thanks for stopping by! We wish you well in caring for an aging cat. If you enjoyed our article, please feel free to share it.